1. Five books bound together: Shirei David, Ohel Yosef, Pri HaEretz, Beit Avraham, Archei Eli. 2. Sha’arei Kedusha by Rabbi Haim Vittel. Printed by Weiss, Jerusalem 1926. 3. Shir HaShirim with Milta b’Ta’ama, by the Gaonim b’Yerushalayim. HaChadash printing, Jerusalem 1924. 4. Responsa of Rav Malchaya, by Rabbi Michael Deutch. Levi printing, Jerusalem 1904. 5. Two copies of the book: Torat Meir, by Rabbi Meir Freiman, Jerusalem, without publishing information. 6. Darka shel Torah, by Rabbi Shlomo Aharon Wertheimer. Printed by Zikaron Shlomo, Jerusalem 1891. 7. Mekor Baruch by Rabbi Baruch bar Moshe of Horodna. Printed by Levin-Epstein, Jerusalem 8. Eshei Moshe by Rabbi Moshe of Bialystok. Jerusalem 1908. 9. Hemdat Zvi, by Rabbi Zvi David Glazer. Pritned by Yehuda v’Yerushalayim. Jerusalem 1933. 10. Kumi Roni, by Rabbi Asher Zelig Margaliyot. Printed by Zuckerman, Jerusalem 1925. 11. Chesed L’Avraham by Rabbi Avraham Zvi Brodna. Printed by Yehuda v’Yerushalayim. Jerusalem 1931. 12. Two books bound together: Imrei Zion and Ner Menorot. 13. Beit HaBechira, by the Meiri. Printed by Hirschenson, Jerusalem 1885. 14. 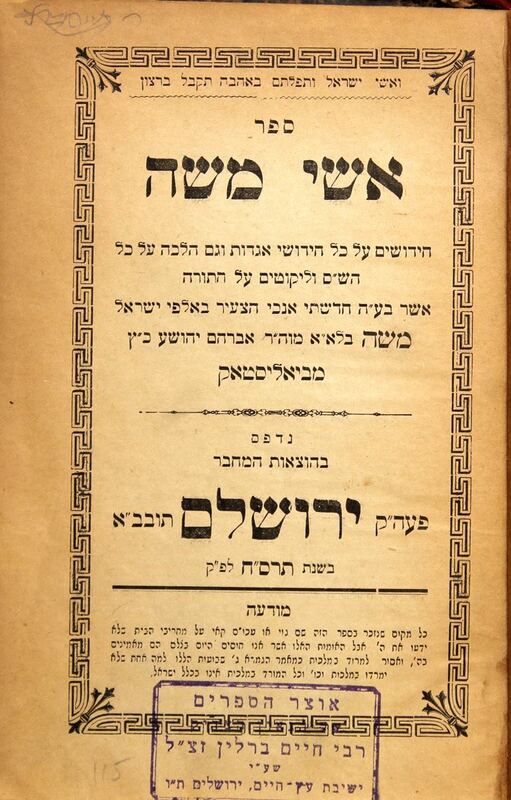 Torah miZion, by the Geonei HaDor in Israel and abroad, Zuckerman printing, Jerusalem 1901. Many of the books are stamped by the Gaon Rabbi Haim Berlin, son of the Natziv of Volozhin (see about him in other items from this catalogue. Different sizes and conditions, generally ok to good condition.